Because the earliest days of rock history have been so poorly chronicled over the years the chance to clear up matters that otherwise are in danger of being erroneously reported (if they’re even touched upon at all) is one of the more rewarding aspects of doing this project. I don’t know how many people will ever read all of these reviews – currently over three hundred total and we haven’t yet hit even two full years of rock’s lifespan – nor do I know if they’ll have any sizable effect on the narrative of rock ‘n’ roll’s story, but at least I know the relevant facts will be “out there” someplace in the hazy netherworld of the internet for anybody who’s legitimately interested in knowing what rock music is, where it originated and who was performing it. Ahhh, well, that last one is where it gets even hazier, at least for this one release, as we have for the first time, but unfortunately not the last, an instance where the credited artist who drew the acclaim for a record when it became a hit is NOT the artist who should’ve been credited. So settle back and let’s recount the ways all of this confusion will play out. Okay, let’s cut to the chase just so nobody thinks they’re being strung along to find out the particulars of this convoluted ordeal. 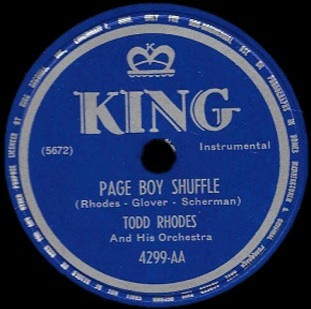 Page Boy Shuffle was written and recorded by Todd Rhodes on January 25, 1949… in Cincinnati, Ohio. The locale is the important part of this equation. Rhodes, as we know from his previous entries, had been signed in 1947 to the Sensation label out of Detroit, Rhodes’s home city where he was a popular club attraction throughout the 1940’s after a recording career in another lifetime ago with McKinney’s Cotton Pickers. Sensation was a small time operation that had just started up that same year and their distribution was limited to Michigan and parts of Ohio. As a result they worked out deals with other labels, first Vitacoustic, then when they went under with King Records to distribute their records nationally. The deal was that King got to choose which records they felt had potential enough to warrant a national release and those would then be issued on King for sale all over the United States with the exception of Michigan and parts of Ohio where the Sensation original release would continue to be sold. It’s this deal which is what vaulted Todd Rhodes into a national star when his Blues For The Red Boy, a record that sold well locally when it came out in November, 1947 on Sensation, exploded into the Top Ten when eight months later it was re-issued on King right after the two companies signed their agreement to partner up in this fashion. Rhodes then got another hit when a song from this same January 1949 session – Pot Likker – was issued as Sensation 15 in March, 1949 and simultaneously as King 4287. As always the Sensation label got to sell it in their own territory while King got the rest of the country which probably accounted for the majority of total sales, even though Rhodes was always most popular within his home region. King Records was aggressively using these distribution deals to acquire the best talent from these smaller labels, sort of an amoeba-like method of merging with, then taking over and stripping the parts from, the original label. They were doing it with DeLuxe Records after buying up 51% of the company to ostensibly give David and Jules Braun, its owners, an influx of cash. Syd Nathan, King’s owner, then pushed the brothers out the door and in the process got what he wanted, another label to use as a subsidiary, but more importantly he got Roy Brown, the inventor of rock music and one of the biggest stars in the field. Nathan was also looking to do the same with Gotham Records in order to get his hands on saxophonist Earl Bostic, who would in time become the most prolific act on the King label. So it’s not hard to see that Sensation Records were about to lose Todd Rhodes to similar machinations if they weren’t careful and the fact this was the first time Rhodes was brought in to Cincinnati for a session overseen by King Records themselves probably should’ve tipped them off that something was afoot. Rhodes himself likely didn’t care where he recorded his sessions, or who oversaw them. He was a veteran artist with a top notch band and typically had the tightest arrangements of his own material, so all the producer had to do was remember to hit “Record” and shut off the lights when they were done. But here’s where it gets interesting. The Rhodes band remained virtually unchanged for years. Rhodes played piano and the sound of the group was anchored by three saxophonists, Hal Dismukes on alto, Louis Barnett on tenor and George Favors on baritone. Yet for this session, the first at King remember, they had a fourth saxophonist, as Joe Thomas (a King contracted artist) sat in on second tenor. Now this was certainly a good development from a musical standpoint, as we’ve spent many months here talking about how the rock sound was increasingly defined by the saxophones rather than the trumpets which had been the go-to horn of choice for previous musical styles, including jazz. Rhodes had seemingly realized this before anyone and while he DID have a trumpeter in his group in Howard Thompson, he generally took a back seat to the saxes. But what was Thomas, who never became a member of The Toddlers, doing there in the first place? Did Rhodes himself bring him in, or did King Records add him to the session for some reason even though another tenor sax was probably extraneous? We don’t know. Everyone involved is long gone and even when they were still around the aforementioned lack of historical interest in rock’s early pre-crossover years was sorely lacking, so no interviews were done to delve into this unfortunately. But here’s what we DO know. Sensation Records released this as by Todd Rhodes, THEIR contracted artist, the writer of the song, the leader of the band and the focal point of the session itself. When King Records issued the same recording they put it out as by Joe Thomas (His Sax and His Orchestra)!!! That must’ve been news to Todd Rhodes, as he certainly hadn’t handed over HIS group to a moonlighting sax player to be credited as Thomas’s orchestra! The end result of this though was King Records, with its national distribution, deep pockets for promotion and general lack of moral rectitude, got THEIR contracted artist, Joe Thomas, a Top Ten hit out of it. Thus history records Page Boy Shuffle as a Joe Thomas record, robbing Rhodes of another hit to contribute to his legacy. So that’s the twisted story, but how about the record itself, which is the same performance of the same song by the same musicians on both the Rhodes credited Sensation release and the Thomas credited King release? You may remember – though after all of that backstory you may not and if not I can’t blame you – that earlier this month we met Joe Thomas for the first time on Backstage At The Apollo, availing himself fairly well after a sluggish start, one too tied to the swing mentality from which he emerged before he began cutting loose midway through and warmed up to the rock mindset he’d need to make a go of it in this field. Well here, assuming it’s Thomas who takes the lead horn, which is no sure thing – in fact it’s probably not, as why would Rhodes let this “guest” musician have a featured role? – the swing holdover has been replaced by a more modern style from the start, even though the entire record displays a more subdued sound than what was heard by the end of that last effort by Thomas. For starters there’s no massed horn charts to deal with. Though this session has five horns on it, only one is prominent to start with – Thomas or Barnett on tenor – while the others make their first appearance on a joint riff after the intro before stepping out altogether. The entire first half is essentially the elongated set up, something modest in intent and as a result only modestly pleasing. Halfway through there’s a bit more passion applied and then a second tenor takes the lead, as you can clearly hear them switch off. Of course if THIS is Thomas then maybe he deserves having his name out front because it’s by the far most exciting aspect of Page Boy Shuffle, not only asserting itself most forcefully of all of the instruments on the track, but doing so with a very definite flair. It’s nothing that’s going to knock your socks off, there’s absolutely no chance of competing with most of the more flamboyant leads on the instrument over the past year, but it’s playing a rolling groove that puts this squarely in the rock instrumental stratosphere and thus it works quite well. Two thirds of the way through the others return contributing a distant echoey atmosphere, giving it a haunting quality that further establishes the all-important ambiance. To that end Rhodes’ role on piano, though hardly taking precedent in the arrangement, is nevertheless crucial in setting up the underlying feel, his solid left hand keeping the groove unrelenting throughout, showing just how important “the bottom” was in keeping rock audiences in a trance. We’ve repeatedly said how the sax instrumental in rock had two distinct approaches to use, the wild manic riffs or the keepers of the groove who lock you in with their precision and we know from prior meetings that Rhodes and company belonged faithfully to the latter. As it goes on the groove gets emphasized with increasing power. They never play out of control, another Rhodes hallmark is always keeping everything tight, but the tenor does loosen its tie a little while the other horns trade back and forth, fading out rather abruptly just as we were really getting into it, but in the process leaving us with a desire to play it again. Now that we’ve all heard and can appreciate the musical content of the record we can get down to speculating – and that’s ALL it can be unfortunately – about the crediting of the artists for the King release of Page Boy Shuffle which makes this so intriguing from an historical standpoint. The key factor it seems is in the writing credit, as King Records couldn’t very well claim it was merely a mistake, a misprint of some sort, as they might’ve if only the artist credit was wrong. Then they could’ve said (even if it was a total lie) that they’d recently issued another Thomas record and since this one featured him as well somebody might’ve goofed. But once you change the writing credit from Todd Rhodes to Henry Glover (the acclaimed producer, trumpeter and songwriter in his own right who ran King’s A&R department and oversaw the session) then the legitimacy of that claim goes out the window. This is especially true because the writer for the previous Backstage At The Apollo, the first Thomas release on King, was Thomas himself. Had they done the same here, okay maybe they screwed up, but by putting Henry Glover down it meant that much was done intentionally, leading you to suspect the artist credit was intentional as well. That they also then promoted it in the trade ads as being by Joe Thomas further shows it wasn’t a mix-up as some insist it must’ve been. Sending it out with the wrong label was one thing but advertising it in the weeks to come with those credits wrong (rather than pulling back the releases and re-issuing it with proper credits as they eventually did well down the road as seen on the label below) shows this was a concerted effort from the start on the part of King Records. That leads in turn to the other question – WHY? The best guess – though still just a guess based on reasonable assumptions – is that Syd Nathan was looking to get Todd Rhodes on his own label full time, not sharing him with Sensation Records. 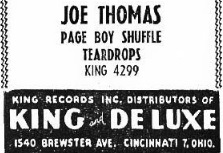 Since Joe Thomas already WAS signed to King, and since he played on this record (maybe at the behest of Nathan) then crediting him instead makes sense. It’d force Sensation into a confrontation, perhaps a court case which King could better afford, draining the smaller company’s resources in the process. That’s how he got DeLuxe away from the Brauns after all, bogging them down in messy and expensive litigation until they capitulated. By changing the writing credit to someone ELSE in his employ it’d mean the mechanical royalties for writing, publishing and sales would all come his way on the King Records sale, while Sensation would be even further hamstrung by losing out on the first of those two outlets (and when King eventually did put it out under Rhodes name they further amended the writing credits to get two thirds of it still!). Now IF this is what happened it does risk alienating Rhodes himself, even if you claim it was all just an honest mistake. Yet Rhodes had to know that he had better odds at securing hits if his records came out on King exclusively and so it might just be best to go with the big boys and leave Sensation behind, even if they went about it in an underhanded way. Which is what happened… Rhodes did in fact wind up on King. It didn’t happen right away, first Sensation ended their distribution deal with King, thereby costing Rhodes sales ironically, but without that added income their days as a barely viable label were nearing an end. When they went under King swept in and picked up Rhodes for themselves… no word on if they even bothered to apologize for what they’d done however (don’t bet on it). Of course the real victim in all of this is, well, to be honest, US! We’re forced to deal with this confusion, trying to set things straight and explain how a hit credited to Joe Thomas wasn’t a Joe Thomas record, even though Joe Thomas played on it! Search engine queries won’t like this at all!!! Actually, the real victim of course was Rhodes, who lost not just one, but two (the pure pop flavored flip-side also scored briefly) hits which would’ve doubled his career total and perhaps elevated him just a bit more historically in the process. 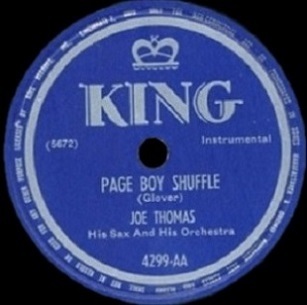 Though he did continue to release some important records along the way, including after he landed at King full-time in 1951, his long term reputation certainly wouldn’t have been hurt if Page Boy Shuffle was in the books as a hit under his own name as it rightly belonged. Well it is here if that’s any consolation, but then again it’s also listed here under Joe Thomas just so we don’t lose any curiosity seekers searching the internet for this record by Thomas who otherwise might never know what kind of plotting, palace intrigue and deceptive maneuvers were standard practice in the record business for years. 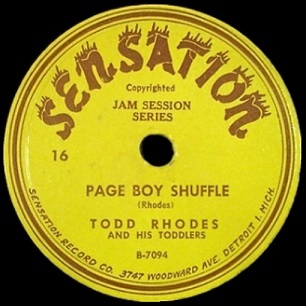 Leave a reply on "Todd Rhodes: “Page Boy Shuffle”"